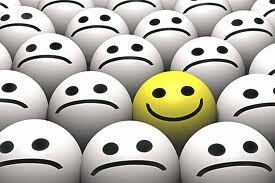 T E F L: Ipsos Global Poll: World Is Happier Place Than 2007. 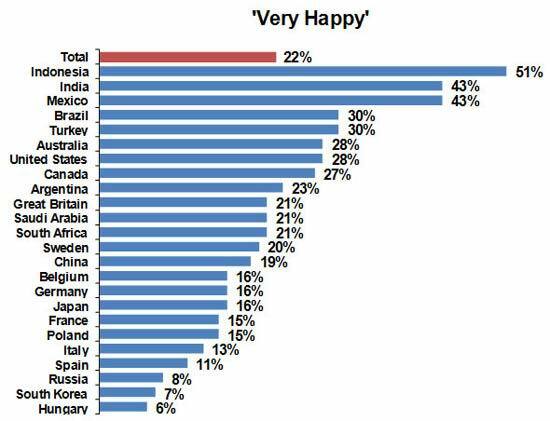 Ipsos Global Poll: World Is Happier Place Than 2007. Framework Level 3 - Unit 10 - Cultural differences. NEW YORK, Feb 10 (Reuters) - Despite economic concerns, wars, conflicts and natural disasters the world is a happier place today than it was four years ago and Indonesians, Indians and Mexicans seem to be the most contented people on the planet. "Sometimes in some countries, the greatest happiness is a cooked meal or a roof over your head while in other countries, financial stability and social status are the factors for their happiness," he explained. "However, relationships remain the No. 1 reason around the world where people say they have invested happiness and maybe in those cultures family has a much greater degree of impact." Regionally Latin America had the highest number of happy people, followed by North America, Asia-Pacific and the Middle East and Africa. Unsurprisingly, only 15 percent of Europeans said they were very happy. On a more personal note, married couples tended to be happier than singles but men seemed to be as content as women. Single men were happier than single women. Surprisingly, older people in general are happier than younger people in most parts of the world.